The greater Akron area gets around 47 inches of snow a year. While that has quite the impact on homes and driveways, businesses and commercial properties seem to struggle the most. If you are the owner of a commercial property, you likely already know exactly what we mean — slipping, shoveling snow, wasted time, etc. The good news, however, is that if you are in the Beaverton area, the snow removal team at ASE Outdoor Solutions is ready to help you keep your property safe and clean this winter. 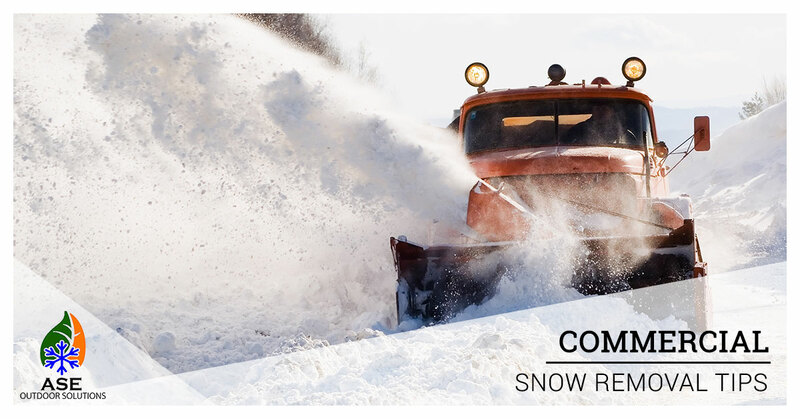 Read on to learn about two key benefits of hiring a snow removal company. When a customer decides to go to your business on a snowy day, they are committing to going outside in the weather, cleaning off their vehicles, and driving in the snow. This is already quite the commitment. On top of all of this, the last thing you want to do is make them trek through snow and walk gingerly on ice to make it to your store. Additionally, keeping your area clean could also bring in new customers. For example, say, there is a competitor down the street who never cleans his/her parking lot and sidewalks while you keep yours clear and clean. Who’s more likely to draw in business? Snow and ice pose a serious threat to your employees and customers. If you don’t perform your due diligence, you could end up facing a personal injury lawsuit. By keeping the parking lot, entrance, and sidewalks free of snow and ice during the winter months, you can help significantly reduce the risk of an accident. Don’t let the winter weather negatively affect your business. If you would like to have the ASE Outdoor Solutions team keep your commercial property cleaned anytime it snows this winter, contact us today to work out a plan — 330-299-4404.